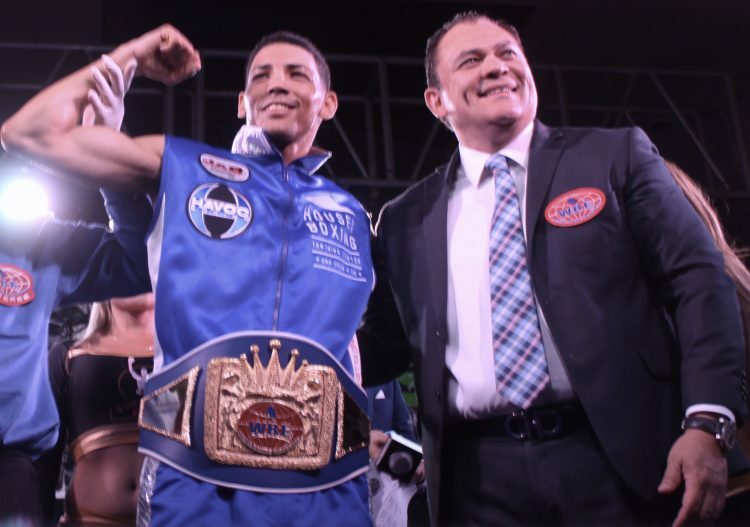 The smile on Marcos Forestal’s face extends from ear to ear and might just remain there as long as he’s the custodian of the prestigious WBF Championship Belt. 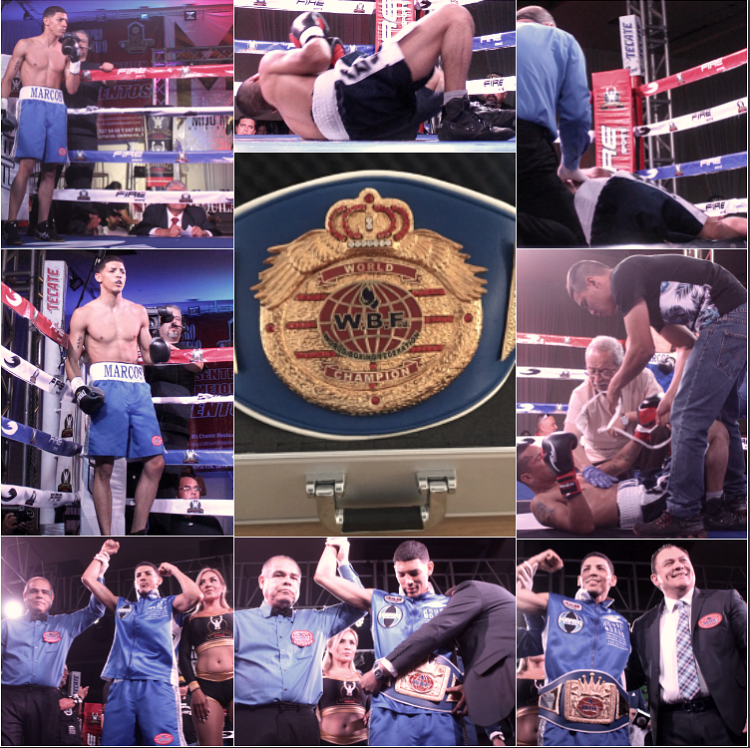 On Friday, June 22, 2018, the Salon Mezzanine was back at it hosting the latest Borizteca Boxing Promotions show “Ahora ó Nunca” (Now or Never) with an added bonus, the contesting of two World Boxing Federation championship belts. 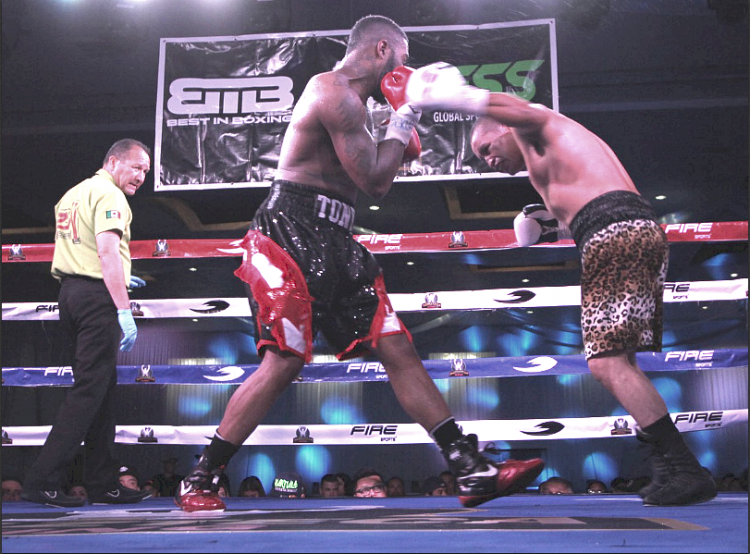 Bout #8 had 28-year-old Marcos Forestal Global ID 780899 (7-0 with 1 NC, 4 KOs, 123.5 lbs.) from Chula Vista, Calif. by way of Guantanamo, Cuba, a three-time National Amateur Champion, who soundly defeated the 34-year-old Daniel “Carrizo” Vega (7-6, 4 KOs, 122.5 lbs.) 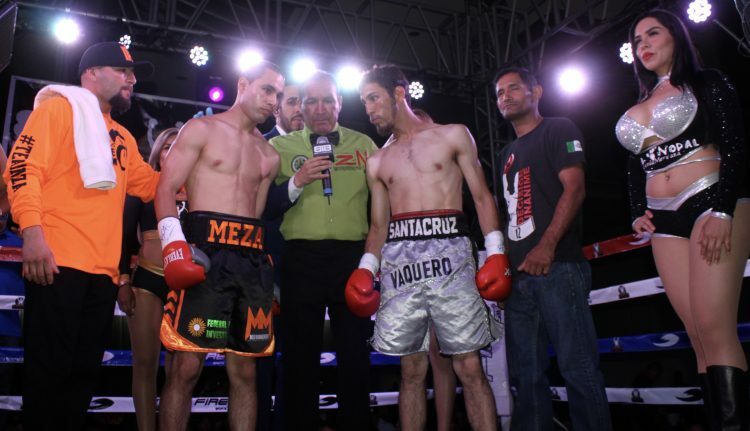 Global ID 373206 from Nacozari, Sonora, Mexico, to win the vacant WBF International Featherweight Title. 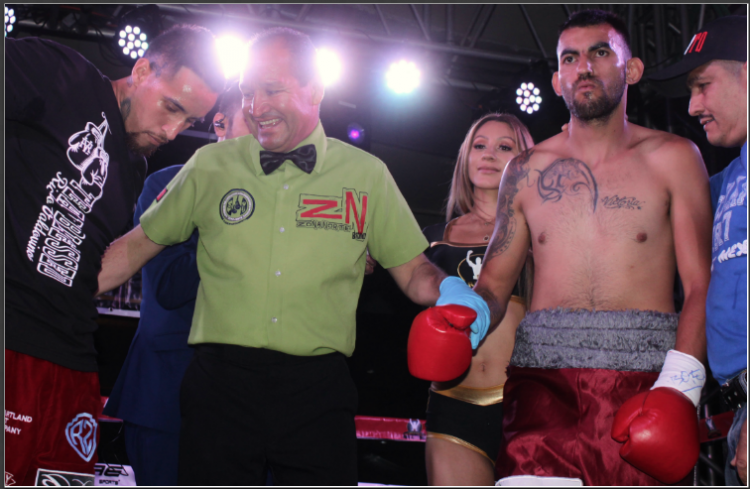 Prior to the Co-Main Event of the evening, we see featherweights Marcos Forestal (l) and Daniel Vega (r) receiving their final instructions from veteran referee Juan Jose Ramirez. 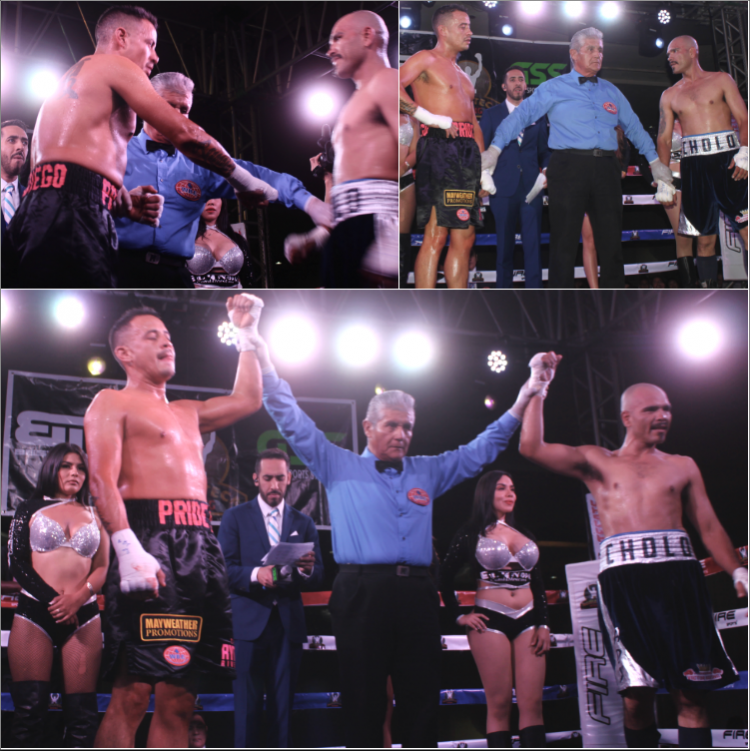 From the get-go, Forestal came out firing and after a short time floored Vega, not once, not twice but three times after delivering these well-placed body-shots to eventually force referee Juan Jose Ramirez to wave the fight off at 1:29 in the first stanza. 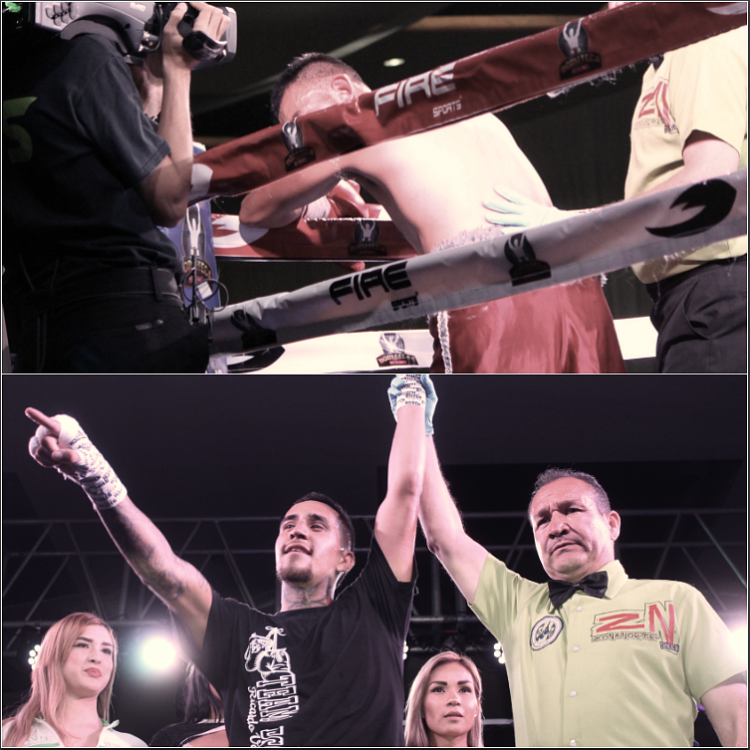 In the evening’s co-feature for the vacant WBF Mexican Super Welterweight title, “the Pride of San Diego”, Rafael Ramirez, (20-4-1, 4 KOs) came up short in his battle with Ramon “Cholo” Barajas. 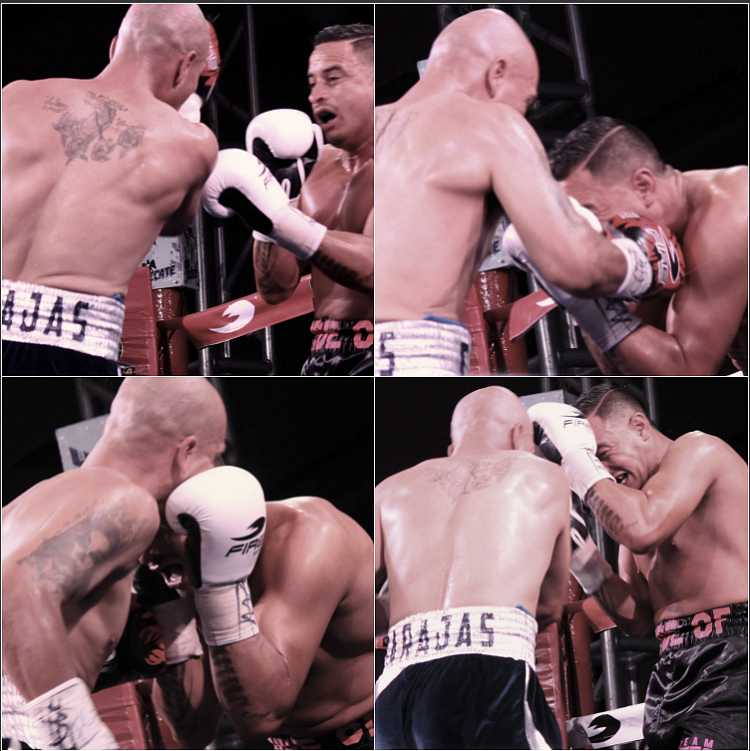 The close-in-fighting done by Ramon Barajas soon became the reason for the butting of heads between Rafael Ramirez and Ramon Barajas. Psychologically, this nasty gash above Rafael Ramirez’s right eye, changed everything. After dreaming about the WBF Championship belt, this is hardly the results they wanted. The Bout was ruled a No-Contest due to this nasty cut/gash over Ramirez’s right eye which came about after an accidental headbutt in round three. Like his 38-year-old opponent, the 33-year-old Barajas (11-16, 7 KOs) came to win and from the outset wildly attacked Ramirez. That being said, Barajas did not land any significant blows against Ramirez who is considered one of the best defensive boxers in the sport. 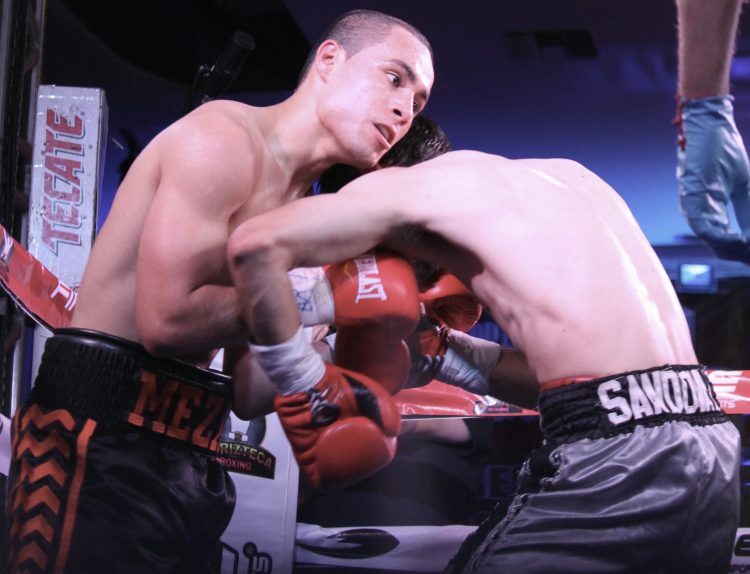 Ramirez, who either blocks most punches, or slyly grabs and holds his opponent, knows how to level the playing field with his counter punching. Regardless, Ramirez had himself involved in an extremely close, difficult match. When checking the judges’ scoring after three rounds, the match was dead even. The ruling on such a cut states, you seek the advice of the ringside doctor, who in turn advises the officials. It was on the doctor’s recommendation that this fight be stopped and as a consequence was ruled a No-Contest. Of course, this ruling was much to the dismay of Barajas, who believed he was ahead in the scoring despite the fact that he was the one responsible for the accidental headbutt. 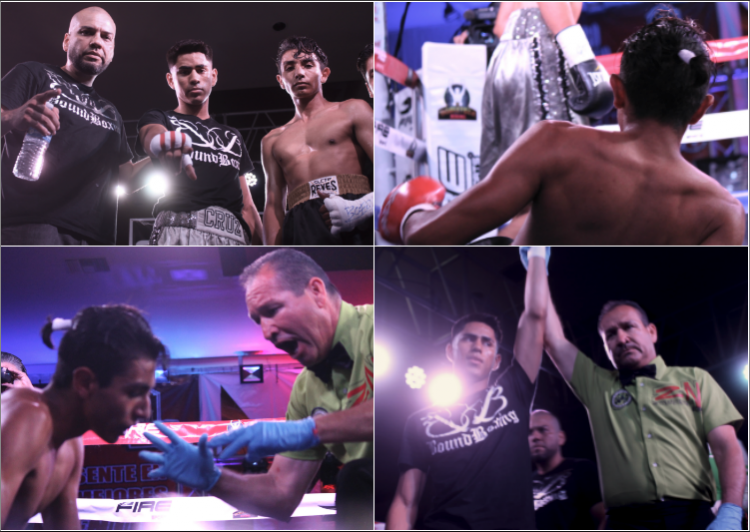 Bout #1 featured two super bantamweights, 21-year-old Jesus “El Perro Callejero” (Street Dog) Rizo (0-0-1 Draw, 118.61 lbs. ), Global ID 836853, from Inglewood, Calif. facing 17-year-old Alan “Tyson” Galindo (0-4, 119.4 lbs.) Global ID 825247 from Tijuana, B. C., Mexico. 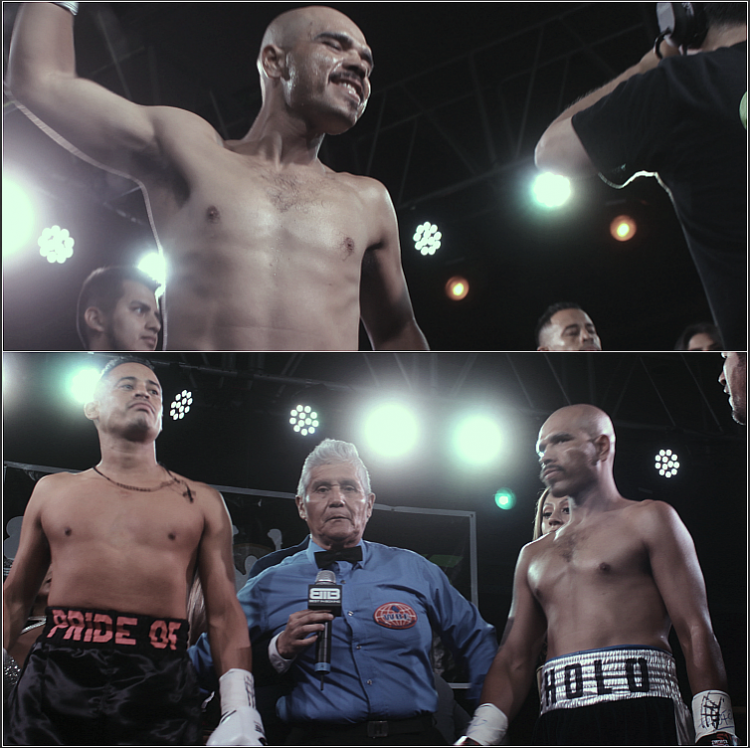 (photo, top, left) Before Bout #1 began, Jesus “El Perro Callejero” Rizo (l) and Alan Galindo (r) joined referee Fernando Renteria in the center of the ring for last minute instructions. 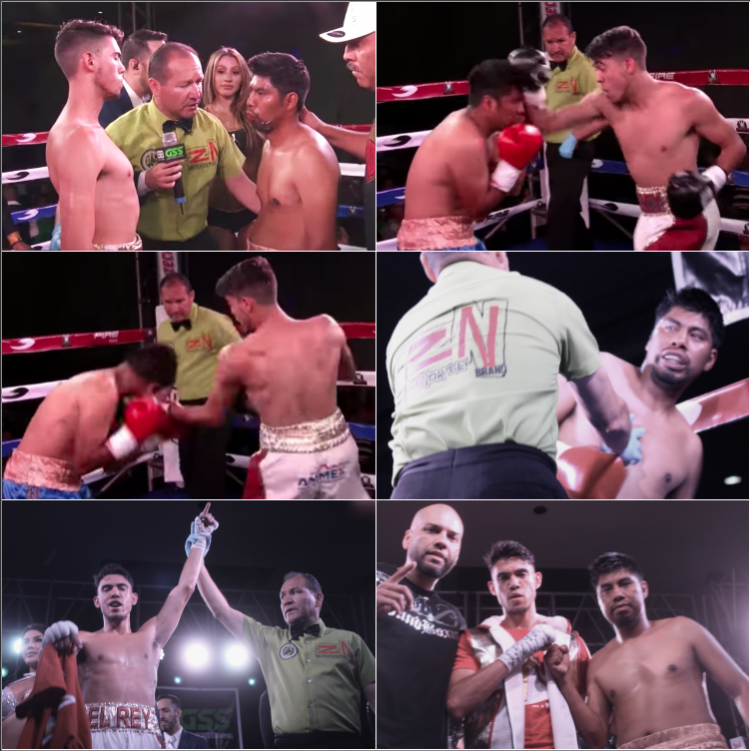 (photo, bottom) Referee Fernando Renteria raises the arm of the victorious Jesus Rizo after his third round TKO victory over Alan Galindo (photo, bottom, right). A quick synopsis: this was another instance where non-stop offense became a boxer’s best defense. In this one, you had the younger, less experienced Galindo, trying his darndest to hang in there and trade blows with the naturally bigger Rizo who as it turned out had more power and better technique. All told, it took Rizo 10 minutes and 32 seconds to overcome the never-say-quit Galindo. The end came at 1:32 of round four after referee Fernando Renteria determined Galindo had taken too many unanswered blows. In Bout #2, it was 22-year-old, 122 lbs. Dilan “El Rey” Miranda (2-0) from Chula Vista, Calif. by way of Tijuana, B. C., Mexico, who now trains at the Bound Boxing Academy in Chula Vista, going up against the 34-year-old Jose Hernandez (0-8) a club fighter from Ensenada, B. C., Mexico. (photo, top, left) Bout #2 opponents Dilan “El Rey” Miranda (l) and Jose Hernandez (r) face each other while receiving final instructions from referee Fernando Renteria. This bout came to a screeching halt in Round #2 after Miranda’s four solid blows had his opponent fall back against the ropes. First, there was the straight right to the head, followed by a devastating right uppercut. As if in a four-punch combination, Miranda finished Hernandez off with a left uppercut followed by another straight right to the head. It’s one of those combinations you see boxers repeat over and over again in the gym while they’re hitting the heavy bag. The official stoppage came at 1:39 of round two. All set to go in Bout #3 we have (l to r) trainer Juan Medina Jr., his undefeated fighter Brandon Cruz (4-0, 2 KOs), 128 lbs., Global ID 811833 from the Bound Boxing Academy in Chula Vista, Calif. and Cruz’s opponent on Friday night, Emanuel Cepeda, from Tijuana who was making his Pro Debut weighing in at 129.5 lbs. They were all at center ring receiving last minute instructions from veteran referee Fernando Renteria. There’s not much to tell you about this quickie bout. 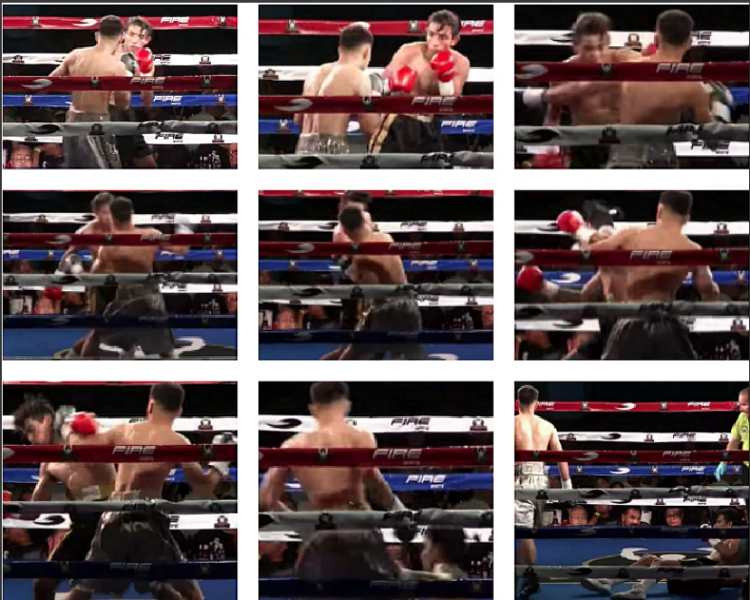 It was over in a flash, or to be more specific one minute and 12 seconds after Brandon Cruz unloaded a combination of a solid right to Cepeda’s chin, followed by a left hook which put the young rookie down for the count. 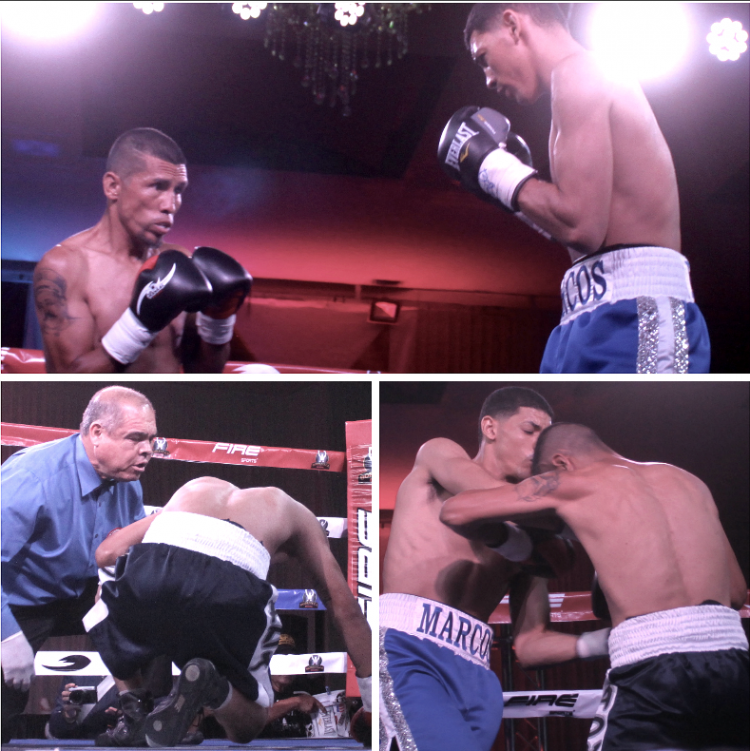 (photo, top, left) At the conclusion of Bout #3, we see trainer Juan Medina Jr. (l), the winner by TKO Brandon Cruz (c) and the unsuccessful debutante Emanuel Cepeda (r). 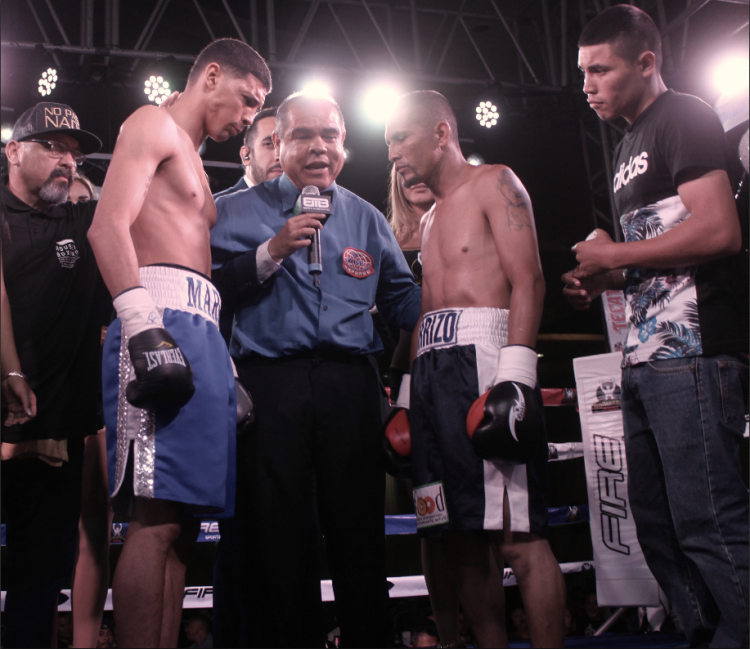 Before the start of Bout #4, boxers Roberto Meza (l) and Manuel Sandoval (r) met in the center of the ring to receive last minute instructions from referee Fernando Renteria. Bout #4 featured the return of Roberto “The Ram” Meza (9-1) from Temecula, Calif., Global ID 759481 who weighed in a 130 lbs. for his six-round lightweight bout against the 22-year-old Manuel Sandoval (0-13) from Tijuana, Global ID 714177, 130 lbs. Surprisingly, Sandoval was the busier fighter early-on to take round one. After coasting in round #1, Roberto Meza (left) pulled out all the stops the rest of the way. 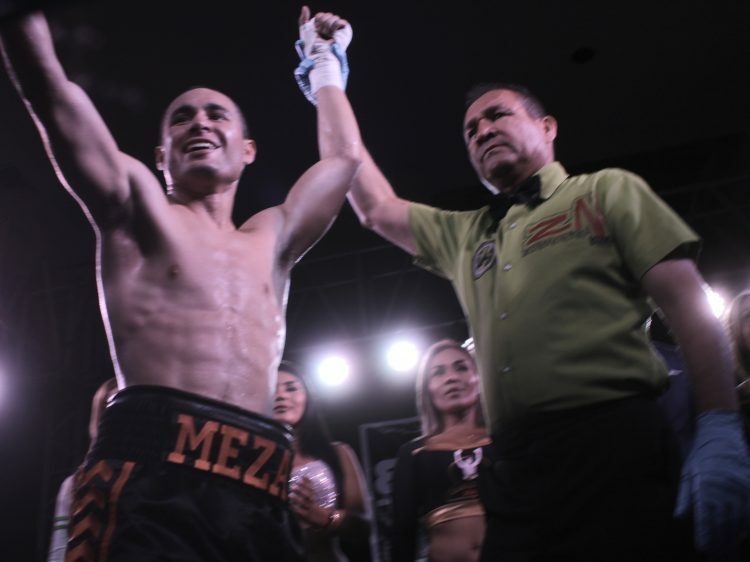 By round three, Roberto Meza had taken over complete control of the bout and referee Fernando Renteria decided it was best to call a halt to this one-sided thumping. Bout #5 featured a six-round welterweight match between 21-year-old Kevin Torres (8-0, 7 KOs) 145.5 lbs., Global ID 775110 from Chula Vista, Calif. by way of Bellingham, Washington, who trains with Carlos Barragan Jr. at the House of Boxing in Paradise Hills, San Diego, Calif. taking on 24-year-old Santiago Arreola Pacheco 0-2, 147 lbs., Global ID 831938 from Durango, Durango, Mexico. Like those who have preceded him, Arreola didn’t last long after he started getting walloped by Torres’ power shots especially the uppercuts. The official stoppage came at 1:39 of round two. With his ninth victory without a defeat, the goal appears to be just ahead – 15 wins with no defeats. 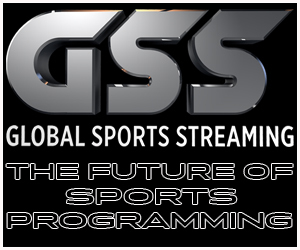 Then it’s off to the big time, the shows at the Casinos, on Showtime, HBO, ESPN, etc. to finally arrive on that slippery slope which leads to the world title. 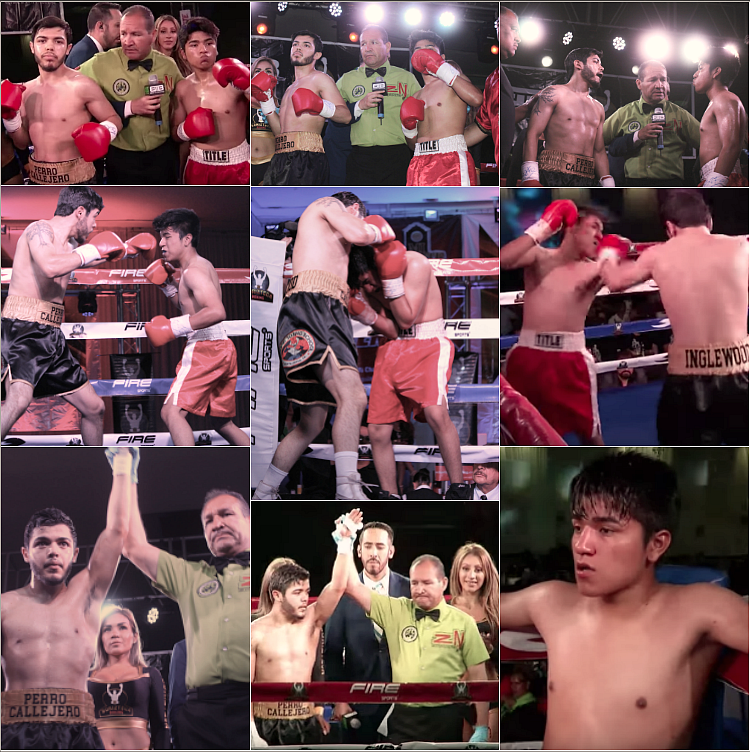 Bout#6 featured Ricardo “The Blessed” Valdovinos (6-0), 141 lbs., Global ID 767464 in a six round welterweight contest against 21-year-old Esteban Cayetano (2-6), 141 lbs. from Tijuana, B. C., Mexico, Global ID 751286. 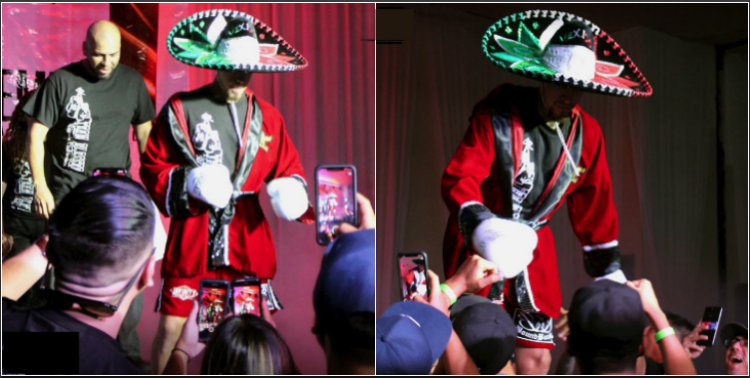 Wearing this beautiful, traditional garb San Diego’s Ricardo Valdovinos went over the top to express his appreciation for the Mexican boxing fans who are always there to support him. 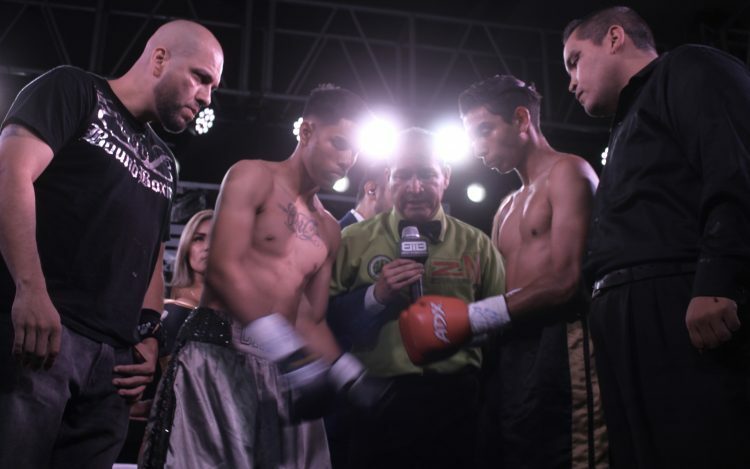 Before the start of Bout #6, Ricardo Valdovinos (l) and Esteban “Trek” Cayetano (r) came to the center of the ring to receive last minute instructions from referee Fernando Renteria. It looked like target practice. It didn’t take long before Ricardo Valdovinos’ punches were landing nonstop, hard and fast at his overwhelmed opponent Esteban Cayetano. Before long, up went the arm of the victorious Ricardo Valdovinos. 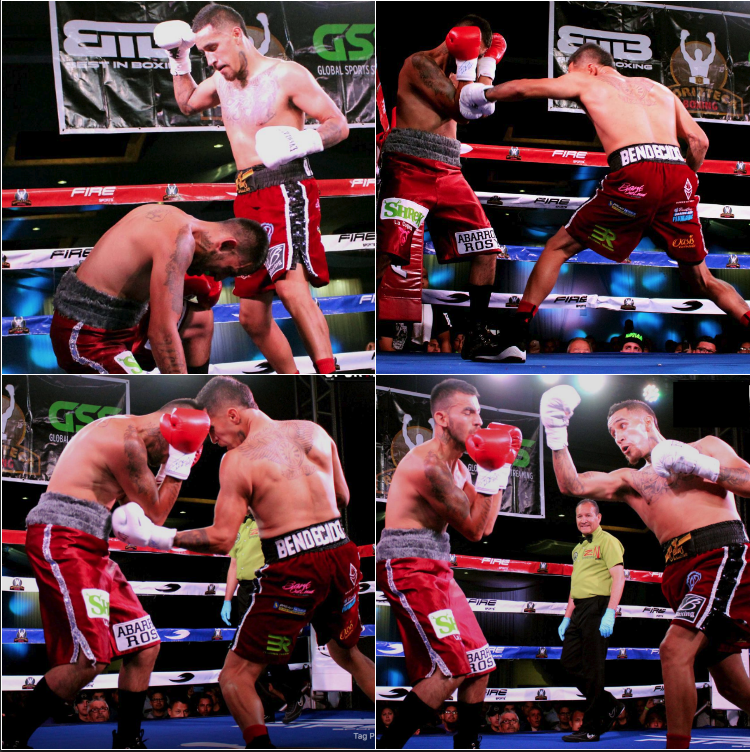 With the sensational win, Valdovinos improved to 7-0 with 5 KOs, while Cayetano dropped to 2-7. 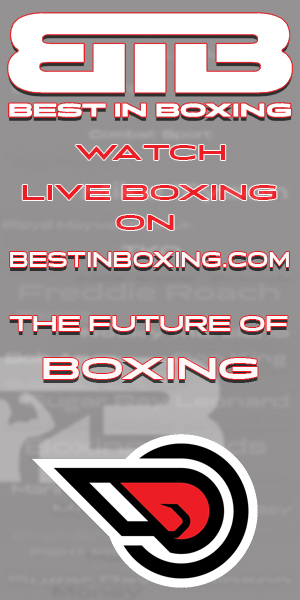 In Bout #7, they featured two wily veterans 34-year-old, 6′ tall Tony Hirsch of Oakland, Calif. (22-6-2, 9 KOs), 174 lbs., Global ID 396717 going up against 38-year-old Manuel “Showboy” Garcia Silva from Mexicali, B. C., Mexico (5-17, 3 KOs), 173.72 lbs., Global ID 387362, in an eight-round light heavyweight bout. With both boxers being extremely durable, this one went the distance and turned out to be a defensive struggle. 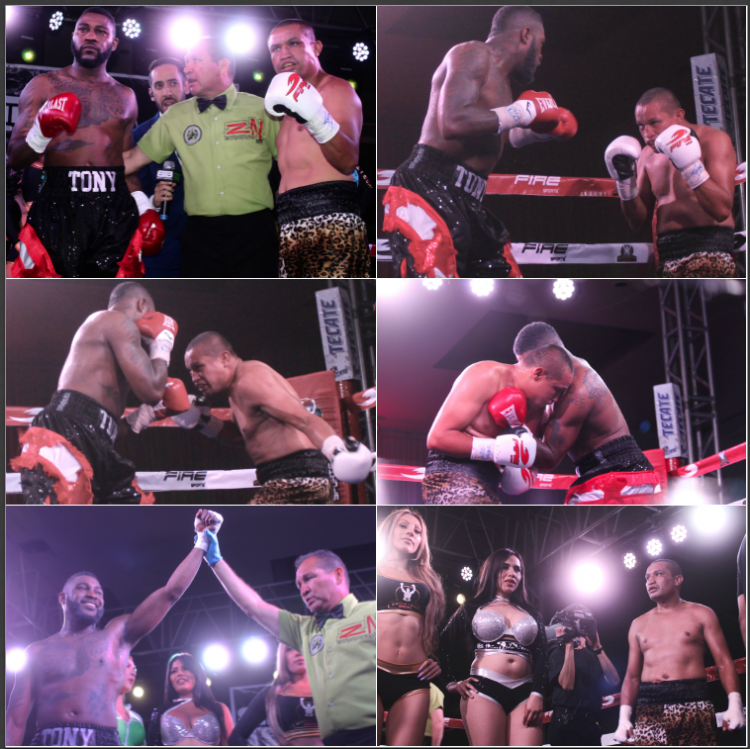 In their eight-round light heavyweight bout, it was Tony Hirsch (bottom, left) coming out on top, winning a clear-cut unanimous decision over tough guy Manuel Garcia.